With tools-free interchangeable disc and cylindrical scrub decks, the Warrior™ scrubber has the flexibility to scrub multiple surfaces in one pass. One-Touch™ scrubbing controls minimize operator training and maximize cleaning performance.A single button automatically selects the correct combination of solution flow and downward brush pressure for regular, heavy or extreme cleaning needs. 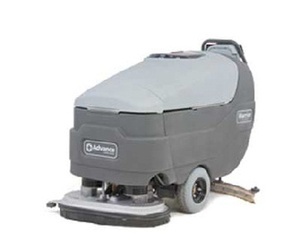 The Warrior™ ST scrubber is built for heavy duty, daily use in a wide variety of applications. The 30-gallon polyethylene solution and recovery tanks allow for extended run time and increased productivity. Plus, tanks are easy to open and clean. The UltraFlow™ squeegee system with wide swing provides 100% water pickup on tight turns, leaving floors clean, dry and safe for foot traffic. The innovative Warrior™ with EcoFlex™ scrubber includes all the standard features of the ST model with the added advantage of Advance’s EcoFlex™ Onboard Detergent Dispensing System that assures manufacturers’ recommended dilution ratios for efficient use of cleaning chemicals, saving time and preventing detergent and water waste. The Warrior with EcoFlex™ scrubber features click-off disc scrub brushes, and an onboard charger for convenient battery recharge. In keeping with the Total Clean® philosophy, the Warrior allows complete and easy access to all machine components for cleaning and maintenance. Total Clean features mean lower cost of ownership and increased productivity to drive down the total cost of cleaning.